Milton, John (1608-1674), English poet, whose rich, dense verse was a powerful influence on succeeding English poets, and whose prose was devoted to the defense of civil and religious liberty. Milton is often considered the greatest english poet after Shakespeare. Milton was born in London on December 9, 1608, and educated at St. Paul's school and Christ's College, Cambridge University. He intended to become a clergyman in the Church of England, but his growing dissatisfaction with the state of the Anglican clergy, together with his own developing poetic interests, led him to abandon this path. From 1635 to 1637 he lived in his father's country home in Horton, Buckinghamshire, preparing himself for his poetic career by entering upon an ambitious programme of reading the Latin and Greek classics and ecclesiastical and political history. From 1637 to 1639, he toured France and Italy, where he met the leading literary figures of the day. On his return to England, he settled in London and began tutoring schoolboys and writing a series of social, religious, and political tracts. In 1642, he married the 17-year-old Mary Powell, who left him after a few weeks because of the incompatibility of their temperaments, but was reconciled with him in 1645; she died in 1652. In his writings, Milton supported the parliamentary cause in the Civil War between Parliamentarians and Royalists, and in 1649 he was appointed Latin secretary to the Council of State by the government of the Commonwealth. He became totally blind in about 1652 and thereafter carried on his literary work helped by an assistant; with the aid also of the poet Andrew Marvell, he fulfilled his government duties until the restoration of Charles II in 1660. In 1656, he married his second wife, Katherine Woodcock, who died two years later, shortly after giving birth to a daughter who lived only a few months. With the Restoration, Milton was punished for his support of Parliament by a fine and a short term of imprisonment. He married for a third time in 1663, to former nurse Elizabeth Minshull, and until his death on November 8, 1674, he lived with her in seclusion. 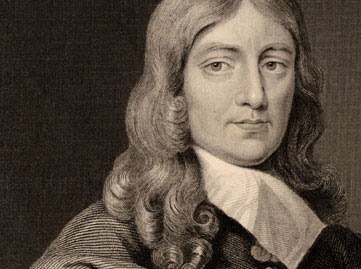 Of the poet's personality, memories written by Milton's contemporaries indicate that his was a singular blend of grace and sweetness and of force and severity amounting almost to harshness. In some of his own writing, he reveals his arrogance and bitterness. Although isolated and embittered by blindness, he fulfilled the tasks he had set himself, lightening his dark days with music and conversation. John Milton's work is marked by cosmic themes and lofty religious idealism; it reveals an astonishing breadth of learning and command of the Greek, Latin, and Hebrew classics. His blank verse is of remarkable variety and richness, so skillfully modulated and flexible that it has been compared to organ tones. Milton's career as a writer may be divided into three periods. The first, from 1625 to 1640, was the period of such early works as the poems written while he was still at cambridge, the ode "On the morning of Christ's Nativity" (1629), the sonnet "On Shakespeare" (1630), "L'Allegro" and "Il Penseroso" (both probably 1631), "On Time" (c.1632), "At a Solemn Musick" (1632-c. 1633), the masques Arcades (1632-c. 1634) and Comus (1634), and Lycidas (1637), a passionate pastoral elegy for Milton's fellow student at Christ's College, Edward King, who drowned in the Irish Sea. Lycidas dwells on the fear of premature death and unfulfilled ambition ("For Lycidas is dead, dead ere his prime/ Young Lycidas, and hath not left his peer:/ who would not sing for Lycidas? He knew/ Himself to sing, and build the lofty rhyme./ He must not float upon his watery bier/ Unwept, and welter to the parching wind,/ Without the meed of some melodious tear"). The stable-stoled sorcerers bear his worshipped ark. his second period, from 1640 to 1660, was devoted chiefly to the writing of the prose tracts that established him as the most able pamphleteer of his time. In the first group of pamphlets, Milton attacked the institution of bishops and argued in favor of extending the spirit of the english Reformation. The first published of this group was of Reformation Touching Church Discipline in England (1641); the one most deeply pondered and elaborately reasoned was The Reason of Church Government Urged Against Prelaty (1641-1642), in which he denounced the "impertinent yoke of prelate, under whose inquisitorious and tyrannical duncery no free and splendid wit can flourish" and which also contains an important digression in which Milton tells of his own early life, education, and ambitions (Such autobiographical digressions are found scattered throughout his prose works). The second phase of his devotion to social and political concerns yielded, among others, The Doctrine and Discipline of Divorce (1643), in which he argued that since marriage was instituted for intellectual as well as physical companionship, divorce should be granted for incompatibility; and his most famous prose work, Areopagitica (1644), an impassioned plea for freedom of the press, in which he demands "the liberty to know, to utter, and to argue freely according to conscience, above all liberties". In Of Education (1644), Milton advocated an education combining classical instruction, to prepare the student for government service, with religious training. The third group of pamphlets includes those Milton wrote to justify the execution of Charles I. Te first of these, The Tenure of Kings and magistrates (1649), deals with constitutional questions and particularly with the rights of the people against tyrants;"No man", he wrote,"who knows aught, can be so stupid to deny that all men naturally were born free." In the final group of tracts, including A Treatise of Civil Power in Ecclesiastical Causes (1659), Milton gave practical suggestions for government reform and against a professional clergy and in favor of allowing people to interpret Scripture according to their own conscience. During his years as a prose writer and government servant, Milton composed part of his great epic poem Paradise Lost and 17 sonnets, among which are some of the most notable in the English language, including "On His Demand Wife" (1658) and the famous "On His Blindness" (c.1652-1655). The apogee of Milton's poetic career was reached in his third period, from 1660 to 1674, during which he completed Paradise Lost (1667) and composed the companion epic Paradise Regained (1671) and the poetic drama Samson Agonistes (1671). Paradise Lost is considered Milton's masterpiece and one of the greatest poems in world literature. in its 12 books he tells the story of the Fall of Adam in a context of cosmic drama and profound speculations. the poet's announced aim was to "justify the ways of God to men". the poem was written with soaring imagination and far-ranging intellectual grasp in his most forceful and exalted style. Paradise Regained, which tells of human salvation through Christ, is a shorter and lesser work, although still one of great richness and strength. In Samson Agonistes, a tragedy on the Greek model composed partly in blank verse and partly in unrhymed choric verse of varied line length, Milton employed the Old Testament story of Samson to inspire the defeated English Puritans with the courage to triumph through sacrifice.